It's time for another round of Swagbucks SWAGO! What is SWAGO you ask? It's a bingo-inspired promotion run by Swagbucks, a website that rewards you with points (called SB) for completing everyday online activities. You can redeem those SB for free gift cards. If you've never used Swagbucks, participating in SWAGO is a great introduction to the site. This particular round of SWAGO is all about online shopping. Shop Swago will begin on Monday, August 29 at 1pm PDT/3pm EDT, make sure you hit “Join” otherwise you won’t get credit for completing the action items. Each square on your Swago Board will contain an action item to complete. Once you complete the action item in a particular square the square will change color signifying the action item is complete. You have a limited amount of time to mark off as many squares as possible so use your time wisely. Be mindful of the patterns and their corresponding bonuses located on the right of your Swago Board. The patterns will vary in difficulty and bonus value. The game ends Monday, September 5 at 12pm PDT/3pm EDT. So make sure to hit “Submit” on the pattern you wish to submit. If you don’t hit “Submit” before the game ends you won’t receive your SB bonus. 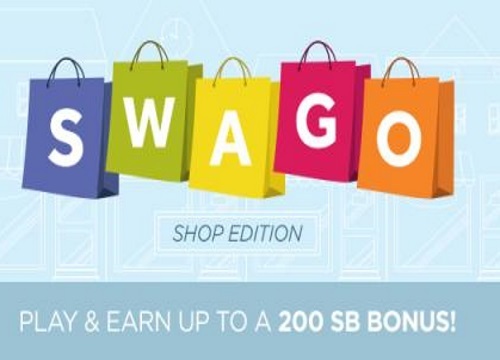 If you're already a Swagbucks member, click here to access the SWAGO page. Click here to sign up for Swagbucks.